or from the Cauchy data of the associated time-independent Schrödinger equation. More recently, Prof. Greenleaf, together with Matti Lassas of the Helsinki University of Technology, Yaroslav Kurylev of University College, London, and Gunther Uhlmann of the University of Washington, have been using insight gained from the study of inverse problems to give a rigorous foundation and introduce new constructions in the burgeoning field of "cloaking", or invisibility from observation by electromagnetic waves. 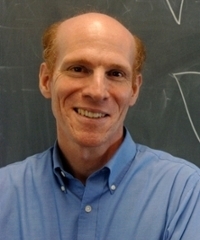 Prof. Greenleaf's research is supported in part by National Science Foundation grants. Cloaked electromagnetic, acoustic and quantum amplifiers via transformation optics by Allan Greenleaf, Yaroslav Kurylev, Matti Lassas, Ulf Leonhardt and Gunther Uhlmann Proc. National Acad. Sci., published online before print June 14, 2012, doi: 10.1073/pnas.1116864109; print: 26 June 2012, v. 109, no. 26, 10169-10174.